It has come to our attention that some of our Herzlniks have returned home wistful for the pure perfection of the Herzl Shabbat celebrations. “Why can’t our family Shabbat dinners be as awesome as the Shabbatot at camp?” “That’s not how you’re ‘supposed’ to do it!” “Why don’t we keep Shabbat like we do at Herzl?” These and many other mournful musings are heard throughout the Herzl, non 54893, world. SPOILER ALERT: You can’t replicate the magic that is Shabbat at Machaneh Herzl! Jewish educators the world over have agonized over this very dilemma and have yet to break the camp code of the fantasy our staffers create for our campers…However, there are some things we can do to enliven our Shabbat celebrations, empower our Herzlniks to bring home tastes of camp Shabbat & keep the spirit alive. 2) How about wearing your Shabbat whites? Our brother-in-laws brother, a Herzl alum himself, once came to a family Shabbat bedecked in his Shabbos whites. It provided a great opportunity to play “Remember When” for multiple generations of Herzl campers. 3) How about a “Song Sesh?” While at the table, you can trade off picking songs that are meaningful to you and your camper… Here’s a link to Herzl’s songbook – Surprise them! 4) Our older children have had Herzl alum Shabbat dinners in the cities they are living…We have heard stories of great times had in NYC, LA, Chicago, Jerusalem and around the globe. 5) Let your camper direct the “Shabbat Seder.” Allow your camper to show you how it is done at Herzl-even if it differs from your usual routine. To help, here’s a link to our Birkat Hamazon. 6) Is there a University near your home where Herzl staffers attend? How about inviting a staffer to Shabbat dinner. It’s always fun to interact with some of the “legends” in the ‘real world’. 7) (significant number of bullet points used on purpose) Just ask your camper…it is a great way to experience the magic of camp through their eyes…. Please add your suggestions so that we all might benefit and most importantly, Shabbat Shalom l’Kulam! Welcome to our new column! After 18 years as camp moms, we’ve seen it all and are ready to share our wisdom (or at least our opinions) with you. Why do you send your children away for the whole summer?? Don’t you like them?? Friends for Life, camp friends, best friends. Go-To friends…These are all descriptions we hear when our kids talk about their camp relationships. Who knew “Friends for Life,” actually means friends who help you and your kids navigate actual Life? As a non-Twin Cities family, all of our children have Minnesota homes. Laundry is done. Father’s Day is celebrated with grandpas and uncles. Emergency Target runs are made by their Minnesota mommies. Haircuts are arranged…You get the point. Mama Mindy even knows everyone’s chocolate chip cookie preferences. It all began with the annual Mama Mindy phone call to camp about her son’s peanut allergies. She reached out to let us know how to prepare our sons to live with her son’s challenge. Like Marla, I can genuinely say that the friendships my three children have made at camp is by far the best thing for my kids and our family. When Josh was in Noar with his best friend, Matthew Weisberg, he told me about two boys from Kansas City, Daniel Goldberg and Sam Abrams. He said, “They were annoying because they cheered for the Kansas City Chiefs,” and, of course, you only cheer for the Minnesota Vikings. The following year, the four boys were put together in a cabin and a friendship that goes so deep was formed. This is the kind of friendship where you would drop everything in the middle of the night and fly across the world if you had to. With my kids, camp friends always come first. They become family. They grow up together. First, learning to remember to change your underwear, then your sheets, and then everything life throws at you. They do it all with their Herzl friends. Nothing warms my heart more knowing that their camp friends will be by their side forever. The other benefit is the friendships I have made. We are all family now and nothing feels better. So, Mazel Tov to you for deciding to send your child to camp! 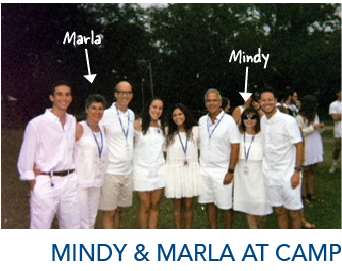 Should you have a concern as a camp parent, we are always interested in sharing our opinions…Believe me… Send your questions and concerns to AskMindyandMarla@herzlcamp.org. I’m luck to live across the street from Mommy Mindy. Before my oldest went to Taste, I went across the street with my packing list and what I’m sure was a look of terror in my eyes. But Mindy gave me all the advice and guidance I needed to make it through that first summer (and all that have come since). From Mindy and Marla: "Hi Sarah! Thank you for the feedback…we were wondering if anyone out there was reading. The “write your mother more” syndrome still exists, even with the cellphone! However, tonight we will bless our children before Shabbat (thank you iPhone) along with their Herzl camp friends in Chicago, NYC, LA, and through snail mail at 54893. Thanks for sharing and Shabbat Shalom!" This is adorable! Thank you so much for posting this. I can't believe my daughter is already going to be in Kadimah this year!!! I am terrified and excited for her all at the same time (which I am sure you both can relate all too well to). As the countdown to camp dwindles down, it is so helpful to read these types of stories from people who can relate to the anxieties you feel as a parent sending your precious children into the (un)known. As well as, the absolute joy you get receiving the one mandatory post card they send (To Elyse and all campers who don’t send more than that, WRITE TO YOUR MOTHER MORE while you are at camp. It will make her very happy! Just saying. ), checking the website multiple times a day in hopes that your kiddo(s) make it in the pictures (easing that day’s anxieties about them being, hurt, un-showered, not fed, lonely, sad, missing home too much, etc. ), and then the days upon days of stories they tell when they get back about all of the shenanigans and tomfoolery they participated in and/or observed! We LOVE Herzl and sincerely appreciate all of the hard work that is done by all of the staff, board members, volunteers, etc. You help ensure that it is all totally worth it! Thank you again.